Editor's Note: Each week, Water & Wastes Digest will post an aggregate of business news briefs and networking news items to keep you informed on facility openings, business mergers and purchases, changes in personnel and award notifications, among others in the water and wastewater treatment industries. If you have business news briefs you would like included in this weekly round up, please email the press release, photo and a link to the post on your website to [email protected] with the subject line "Business News Round Up." One news item per company per week will be posted. The recent announcement about the formation of the Alliance to End Plastic Waste was welcomed news to the Plastics Pipe Institute, Inc. (PPI). 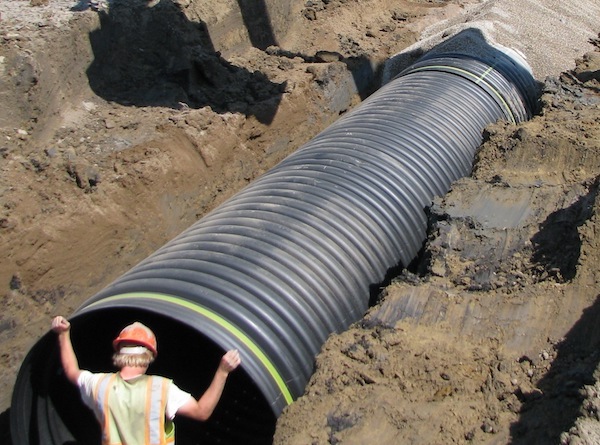 The North American trade association representing all segments of the plastic pipe industry and its members believe the new initiative will help to solve another significant problem aside from eliminating plastic waste. Of the 30 companies involved in the formation of the Alliance, 12 are PPI members. Slayden Constructors, Inc. has been selected by the City of Salem, Ore., to provide turnkey construction services for the $13 million Willow Lake Cogeneration Facility Upgrade project. Construction on the project is slated to begin in Feb. 2019 with completion by mid-summer 2020. Originally constructed in 1988, the Willow Lake Cogeneration Facility is one of 11 facilities in Oregon currently using biogas to produce clean, renewable energy from the byproduct wastewater treatment. Cogeneration facilities recover biogas to produce two types of energy, heat and electricity, which offer operational efficiencies, cost savings and environmental benefits. De Nora has announced it has acquired the Albuquerque-based MIOX business from Johnson Matthey for an undisclosed price. Brown and Caldwell has opened a permanent office in the Metro Vancouver area in British Columbia to better serve clients in the region’s municipal and private water and wastewater sector. The new office is located at Metrotower I, 4710 Kingsway, Burnaby. “This new office aligns with our vision of expanding full-service solutions in the Lower Mainland while continuing our legacy of solving Metro Vancouver’s most complex water and environmental challenges,” said Bryan Paulson, Brown and Caldwell’s Vancouver local leader. Opto 22 announces the addition of international standard IEC 61131-3 programming options in its groov EPIC edge programmable industrial controller. Adding these new programming options to the existing flowchart and custom user-written options in groov EPIC gives control engineers the ability to program using a variety of languages they already know, while taking advantage of the EPIC’s extended capabilities for automation and industrial internet of things (IIoT) applications. All IEC 61131-3 standard languages are supported by groov EPIC, including Function Block Diagram, Structured Text, Sequential Function Charts and Ladder Diagram. Adding the IEC 61131-3 option gives engineers several key advantages. First, they can pick the best software tool for their specific application. Second, they can mix and match several software tools to build control and IIoT solutions on one unified platform. And last,companies can continue to leverage existing employee knowledge in IEC 61131-3 programming methods, including decades-old ladder logic. SUEZ honored a project at Federated Co-operatives Limited’s Co-op Refinery Complex (CRC) with the first-ever Resource Revolution Award. The award was designed to highlight projects that improve business while enhancing the goals of sustainability and resource reuse. Co-op Refinery Complex is receiving the award for its Wastewater Improvement Project (WIP), which came amid an expansion of the refinery’s production capabilities. By incorporating leading-edge technology, CRC is now capable of reusing its wastewater for the purpose of steam production. The WIP reduces the refinery’s freshwater consumption by 28%, which is the equivalent of 3,100 households in Regina. In 2017, Aquatech International was awarded a contract by international oil and gas services company Petrofac to design, engineer and supply Source Water Treatment Package for Kuwait Oil Company as part of the Lower Fars Heavy Oil Development Project, Phase One. Now well underway, the project represents a benchmark in sustainable water management. The solution developed by Aquatech is the first to use municipal wastewater reverse osmosis reject to feed boilers located 120 km away, while also providing significant cost reductions to the client. The Water Council applauds Governor Tony Evers and Speaker Robin Vos for their recent announcements to find solutions to ensure clean water for Wisconsin’s citizens and businesses. Governor Evers’ declaration that 2019 is the Year of Clean Drinking Water in Wisconsin and Speaker Vos’ creation of a task force on water quality are important steps to tackle water issues in rural communities and urban neighborhoods. Smart Energy Water (SEW) has signed a multi-million dollar agreement with IBM to leverage the IBM Cloud for SEW platform global deployment over the next five years. Through the new agreement, SEW will access the flexibility and scalability of the IBM Cloud to provide a common global infrastructure for their enterprise web and mobile applications. These workloads include customer engagement and mobile workforce engagement applications, online bill processing, energy efficiency and demand response applications, reward programs as well as tools for real-time data collection and management in the field. For example, a large scale energy company may turn to SEW to deploy its full digital customer and workforce engagement platform with IBM Cloud. SEW can now scale its services faster, more easily and at global scale to help the company meet the fluctuating demand of its customers. Itron, Inc. have announced the Itron Bridge 5-WS is one of the first products to receive Wi-SUN Field Area Network (FAN) 1.0 certification. The Wi-SUN Alliance granted certification to products based on their compliance to the FAN communications profile and their ability to interoperate with other Wi-SUN FAN certified products, as verified by an independent third-party testing laboratory. This important industry milestone is the result of several years of intense collaboration between many technology suppliers that include leadership by Itron. The Board of Directors of the Water and Wastewater Equipment Manufacturers Association (WWEMA) has elected John Dyson to assume the position of Chairman for its 2019-2020 term. Dyson has been involved with WWEMA for over 24 years. During this time, he has represented WWEMA at EPA, AWWA and WEF meetings, as well as participated in various WWEMA committees. His role as Chairman includes serving on the Strategic Planning and Executive committees and providing leadership to the organization. Dyson is currently employed by Aqua-Aerobic Systems Inc. as a Product Channel Manager - AquaPrime. Dyson has been with the company since 2016 and has over 30 years of experience in the water/wastewater industry. MFG Chemical has announced the appointment of a new Chief Financial Officer, Darin Gyomory.